Published: Nov. 27, 2013 at 01:03 p.m. Updated: Nov. 27, 2013 at 05:41 p.m. The spate of off-field problems for the Minnesota Vikings continues to grow. Linebacker Erin Henderson was arrested shortly after 3:15 a.m. Tuesday, Nov. 19, on probable cause of driving while impaired and possession of a controlled substance, according to a statement released Wednesday by the Eden Prairie (Minn.) Police Department. The arrest happened at the Fredrick-Miller Spring, on Spring Road just north of Flying Cloud Drive, police said. 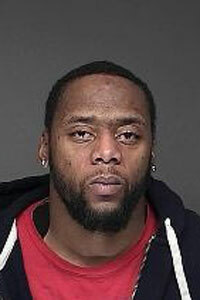 Henderson was booked and released at the Eden Prairie Police Department. No other information was released. The St. Paul Pioneer Press first reported the news. NFL Media spoke with Henderson's attorney, David Valentini, who filed a petition Tuesday on Henderson's behalf to preserve his right to have a hearing to contest the revocation of his driver's license due to the arrest. The petition claims that the officer did not have "valid articulable grounds" to stop Henderson, who was driving below the speed limit and "was not driving erratically." The officer also misinformed Henderson about his right to refuse a chemical test, according to the petition. Vikings coach Leslie Frazier commented briefly on Henderson's arrest Wednesday during his daily news conference. Henderson missed the Vikings' 26-26 tie with the Green Bay Packers in Week 12 as a result of what Frazier had called "a personal matter." "I mentioned last week that (Henderson) was dealing with a personal matter, and that was absolutely the truth," Frazier said. "There are some things I can't talk about involving that situation." The news comes on the heels of two recent Vikings arrests. Minnesota released cornerback A.J. Jefferson after he was arrested Nov. 22 on probable cause for domestic assault. On Wednesday, prosecutors charged Jefferson with one felony count of domestic assault by strangulation. Wide receiver Jerome Simpson was arrested on probable cause of DWI on Nov. 9. Simpson has also retained Valentini as his attorney and remains on the team. "The fact that we have had three recent off-field situations is unacceptable and disappointing," Vikings general manager Rick Spielman said in a statement Wednesday. "Our organization looks at each situation and the circumstances involved to determine our actions with those players and how to best move forward. "The Vikings have a comprehensive approach with our player development program and excellent resources that are a part of this organization, but certainly we will take a methodical look at how we can improve upon our current programs to prevent these situations in the future."